Prior to Oracle 11g, the lowest unit of RMAN parallelism was datafile which means you could not backup single large datafile in parallel. 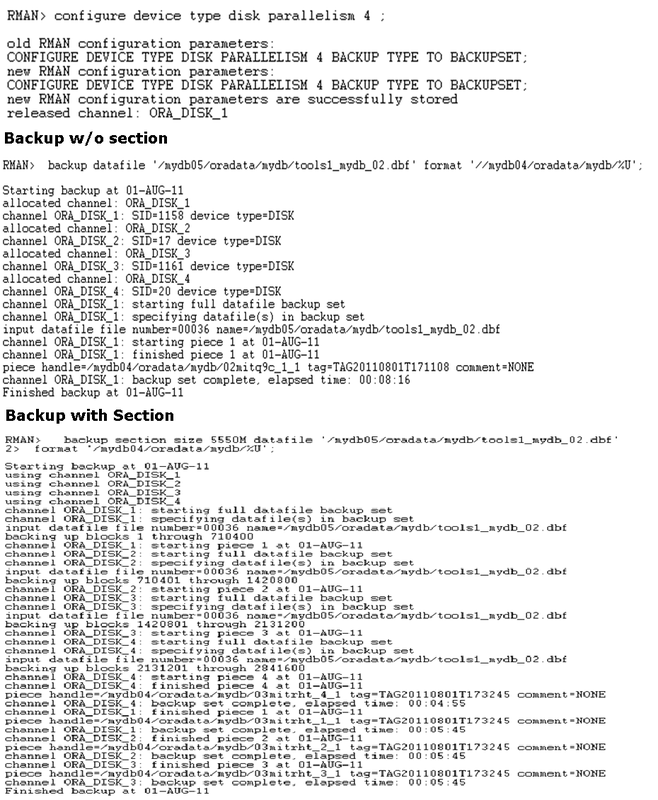 Starting with 11g , Oracle supports backing up of a single datafile in parallel using the concept of sections. A section is contiguous range of blocks in a datafile and as of 11g , up to 256 Sections or channels per datafile is supported. This is very useful if you are using big tablespaces. Please be aware that multiplexed backups will not contain datafiles or sections from other datafiles if section backup is used. Improved performance for backup and restore. In the example below, backups using section concept took 30-40% less time than conventional RMAN backup. Pease click on the image below for large font size .